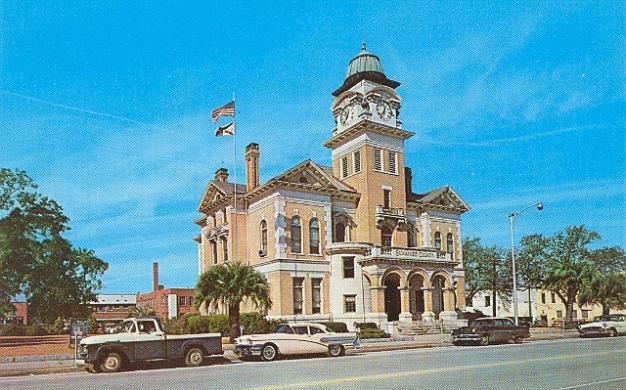 Suwannee County (pop. 41,551) is south of Hamilton County. It’s the only Suwannee County in the U.S. 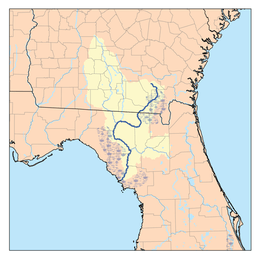 The 246-mile Suwannee River, for which the county is named, begins in Georgia and makes two big bends in Florida, forming the northern, western, and part of the southern borders of the county. It starts in the Okefenokee Swamp. 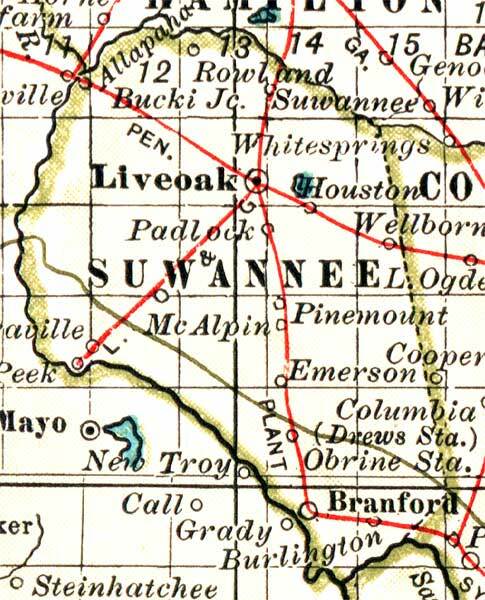 The county seat of Suwanneee County is the city of Live Oak (pop. 6,859), named for an oak tree that was a resting spot for railroad workers in the 1800s. 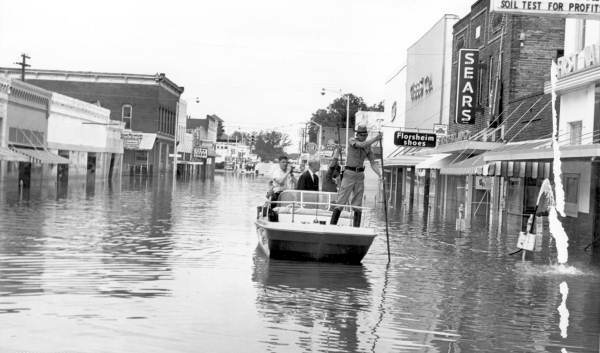 Hurricane Dora, in 1964, did major damage in Live Oak after hitting Jacksonville. Gov. C. Farris Bryant surveying the damage in downtown Live Oak. 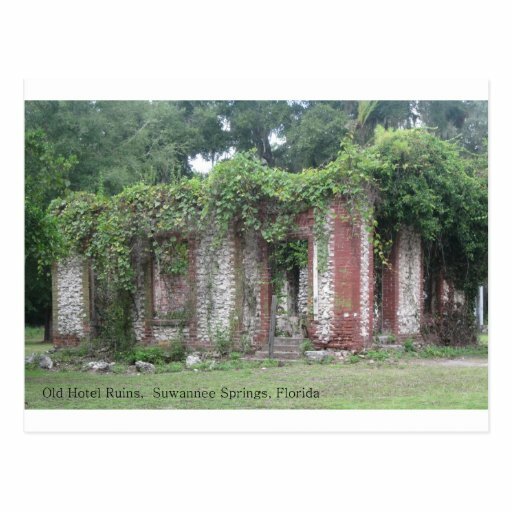 Suwannee Springs, near Live Oak, was once a popular resort area. It has six springs, five of which flow directly into the Suwannee River. The last hotel burned down in 1925. 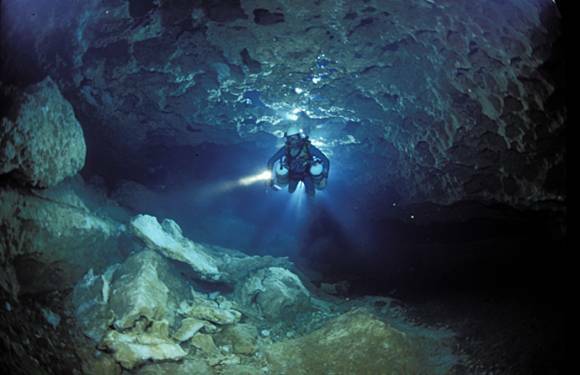 Suwannee County, with its springs and underwater caves, is known worldwide as a center of cave diving. The dissolved limestone rocks that produce underground caves in the area are also responsible for the many sinkholes. Suwannee River State Park, near Live Oak, is popular for canoeing, birding, fishing, and camping. This entry was posted in Florida and tagged cave diving, Hurricane Dora, Live Oak, Suwannee River State Park, Suwannee Springs.